Pro Spot International Inc. - Training Division is committed to offering Squeeze Type Resistance Spot Welding (STRSW) and Metal Inert Gas (MIG) welding training and information to all of the automotive and light truck collision repair industry so that collision repair technicians, managers and shop owners can attain the necessary knowledge to safely perform STRSW and MIG welding repairs to the highest standards of quality. We continuously remodel our lecture and interactive training according to changes and trends in the collision repair industry. 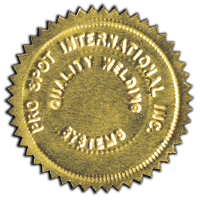 In this way, Pro Spot International Inc. - Training Division maintains a constant level of excellence in education and training. The CASE program offers a certification of providers of training for working technicians. The National Automotive Technicians Education Foundation (NATEF) will evaluate the training providers' process of developing and delivering training and then recommend certification as an ASE Certified Training Provider of Continuing Automotive Service Education (CASE). Explain the difference between the effectiveness and benefits of STRSW and GMAW (MIG) welding. Evaluate cost savings, overall time savings and ease of the STRSW process compared to GMAW (MIG) structural and non-structural welds. Perform correct and approved STRSW and GMAW (MIG) structural and non-structural welds. 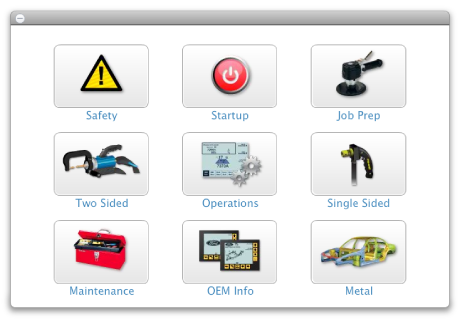 Demonstrate the ability to make and destructive test OEM recommended STRSW and GMAW (MIG) structural and non-structural welds. Describe the technology used in making STRSW and GMAW (MIG) structural and non-structural welds. Identify proper repair procedures for various types of structural and non-structural steel materials. 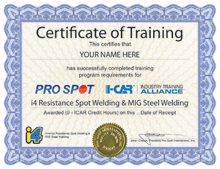 It costs $290 per student to attend this two part combination of online interactive training and testing along with an in class hands-on experience with the i4 Resistance Spot Welder. Students receive a certificate of completion and 9 I-CAR credit hours.